Wednesday 23 February 2011 – Sunday 27 February 2011, 12:00-19:00 daily. This 5 day workshop is designed for up to 12 people, possibly with a background in sound, but with no previous electronics experience. They are shown how to use simple objects from our modern environment (resistors, capacitors, transistors, LEDs, integrated circuit chips…) to design and build their own personal, customized primitive noise synthesizers. Each is a tiny world of its own, using primitive analog computers in combination with feedback, sensors and audio inputs to create a unique sound. Even from the same plan, no two are alike! Participants are encouraged to use found materials for the construction of their personal instrument, with an emphasis on discovering creative and physical methods of controlling them. 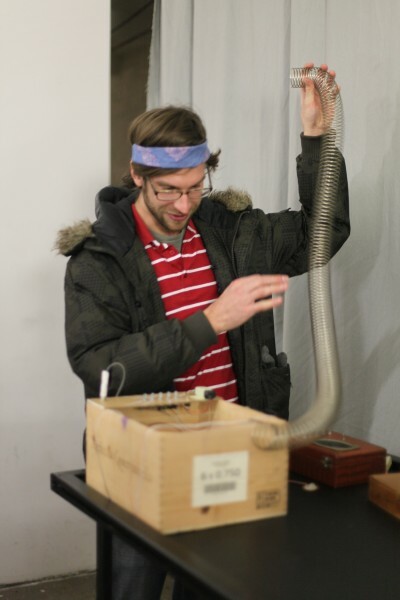 The workshop will conclude with a group performance at Experimontag @ Madame Claude on Monday 28 February and an invitation to the audience to experiment with each of the instruments which have been created. Previous Neanderthal Electronics workshop participants are welcome to join this performance with their own instruments, please contact “MACUMBISTA at_the_domain GMAIL.COM” directly to arrange. FEE: EUR 120 including materials, with a deposit of EUR 27 to be paid beforehand. 1) A Box (REQUIRED): This should be made of thin wood or cardboard. Plastic can also be used, but it doesn’t sound very good, and metal is too difficult to cut and drill with the tools we will have. This box should be a minimum of 10x10x3cm, or bigger if you want to use a larger speaker or have more room to decorate and add objects. Cigar boxes, small suitcases, instrument cases or jewelry/silverware boxes are all good things to look for. At least one side of the box should be no more than 4mm thick, to allow the potentiometers, switches, knobs and jacks to be mounted. 2) A speaker (OPTIONAL): I will provide a selection of speakers ranging from approximately 6-12cm diameter. If you want to use a larger one, you’ll have to provide it yourself. Besides buying one, you can salvage one from old hi-fi systems or portable stereos. 3) Decorative materials/sonic objects (REQUIRED): Please bring as many found objects as you can to decorate your soundbox or use as a sound source via the contact microphone. Photographs, cloth, leather, paper or any other kind of material can be useful for covering the box and making collages. Bones, shells, small sticks, bells, springs, strings, wires or anything else made out of solid yet resonant material make great sound sources. Paint, markers and pens may also be useful. This entry was posted	on Tuesday, January 4th, 2011 at 22:57	and is filed under Announcement. You can follow any responses to this entry through the RSS 2.0 feed. Both comments and pings are currently closed.